No, no, I didn’t mean WoW, but since you mention games – do you know what is an Easter Egg? Easter eggs in games are jokes or hidden messages, or even secret areas – I love these: they are cool and it is fun to hunt for them. Well, mystery meat navigation in webpages (MMN) is similar: the navigation is not obvious to the average visitor. The difference: it is neither cool, nor fun, nor appreciated. In fact, there is a webpage, which features the worst web page designs. One of the criteria to get your site reviewed there, is to make use of MMN. Mystery Meat 1: view the exact date and time in Coffee Corner. I stumbled upon this by pure accident – I was playing in Firebug and just mis-clicked. Hover your mouse over the obscure 4 days ago – and you get something better. Of course, things are not as easy as they seem – this is not the actual time. For my user and time zone I need to subtract 3 hours (this means to calculate times for time zone UTC-3, while I am in UTC+2). It does not matter which country I chose at logon, neither logging in via VPN, located elsewhere, neither using different browsers. I’d love to get feedback from other members in different time zones, who probably have different profile settings than mine and figure out the exact logic. This design decision always bugged me – why you need to hide the exact dates and times, we all know – the information is there, it is not complicated or confusing: people started measuring time in hours many centuries ago, most kids learn to tell the time long before they go to school. 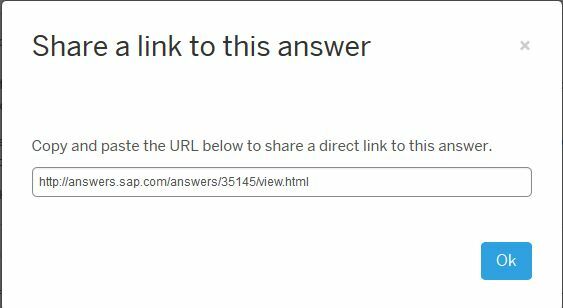 A simple trick: Create a direct link to a specific answer or comment in SAP Answers. Right now it is cruel to ask a new member to go through a long thread in the new site – the sorting options are not that good – if you read the answers and comments in the default sorting by votes, most likely you will be more confused than before you started reading. How do you create a direct link to an answer or comment in SAP Answers? I wish to share Jelena’s answer. Click on the small Share link. It took me a while to find this (initially I used “Inspect element” to get the correct value from the html) – the text is tiny and it is grey, not black. I am not sure if I should be ashamed of that or feel good about myself for finding another workaround. This one is really easy – you don’t need to look at code, all you need is to know where to click. This is a genuine MMN. If you haven’t read it yet, I encourage you to do that: all Jelena’s blogs are fun, and this one summarizes nicely the most important changes in the new platform. Hmmm… where is that share button? Come on… it must be there… why can’t you see it? I log on from different devices (a few laptops and desktops, two phones, a few VM) and I use multiple browsers. Yes, I know: I could use a portable one or sync my bookmarks, but I am a very lazy person. My list is quite big and changes over time – just before the migration, I downloaded about 60 of my bookmarks to PDF – just in case… It is simply not practical to store them in a browser, not the way I use bookmarks (typing in the URL bar lists them). The search results are mostly not relevant for me – I am not interested in the sponsored links, sometimes I can’t remember how to distinguish these, and during Open Beta we found out that the search does not really work well. I have no idea if the SAP team fixed that (from what I understand, this is not part of the current project scope). Ooops… I think I got carried away just a tiny bit (this is about half of what I have). I don’t look at the list very often (I use Ctrl + ↑ and Ctrl + ↓ to switch between them). 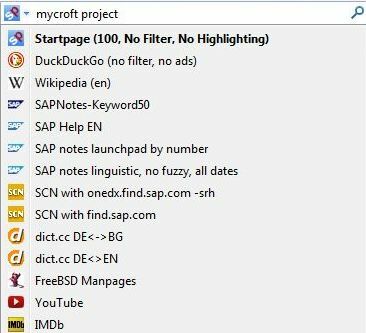 Most of these are created from the Mycroft Project site: you don’t need any special skills for that, it is really simple, and there is a huge list of custom search plugins already. I still prefer to create my own plugins, or at least look at the xml file before I use one of the available engines. There were times, when I had to create manually the xml file and convert the icon to base64… thankfully, this is not needed anymore. Thank you for reading my really long blog, I hope you will find these simple tricks useful. The last part – what are your options to change the look and feel of the website (if you cannot for the SAP team to do that, or just because you are a perfectionist), will take me longer- I am still learning some neat tricks. @Mario, Jelena, Julien: Apologies for shamelessly using you in the examples without asking first. I liked your content, this is why I chose it in my blog (apparently, I am too modest to use my own comments and answers 🙂 ). If you have any concerns – feel free to reach out via DM and I will edit the blog. I’d never run across the Mycroftproject before, thanks for the heads up. I’d also been looking for a way to filter on unanswered questions since going to the community pages that have been setup does not provide that as a filter option. Great blog. Have you run across any method for finding liked content? I found that feature on the main page of the old SCN very useful in being able to quickly check out new quality content. 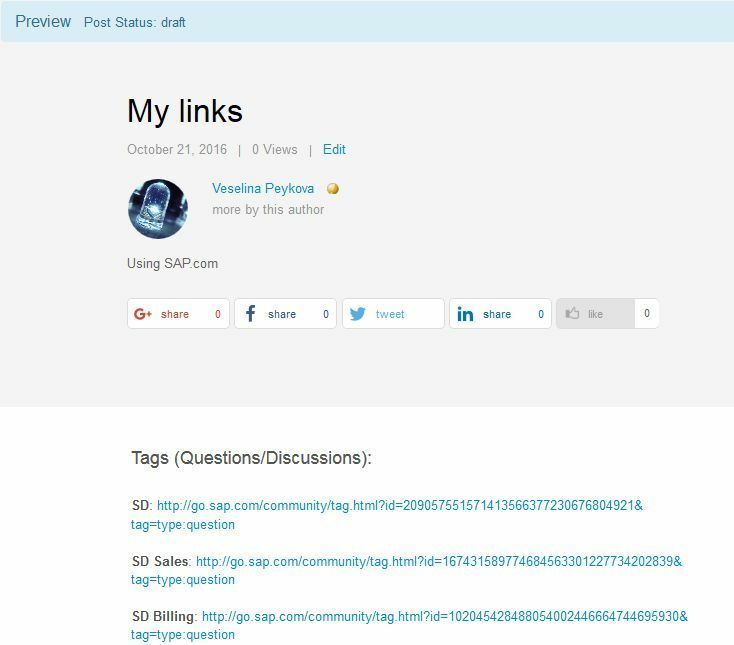 If you meant top liked blogs for a specific tag – no, unfortunately you can’t get these without some development by the SAP team. For the Q&A part of the site, there is something, which looks like sorting by likes or views or votes, but I think, it does not work as expected. From what I know, the featured content on topic pages is maintained manually – this is the closest to top liked content, which we can currently get, but not all tags have topic pages. I find good content now thanks to the forum members, who I follow. I can’t dedicate a lot of time during the work week to actively hunt for cool content. Jelena Perfiljeva tried to start an initiative for collecting links to interesting blogs, published for the month, but with the new platform her blog did not get many views. I don’t know if she intends to publish a new one for December/January. very helpful, thank you! Too bad it only got 127 views so far 🙁 . I have just noticed the “share” link on answes.sap.com-comments, although I have already read your blog some months ago. (Well, semi-read it seems, as you point that feature out very clearly). I have been using the link behind the timestamp in the upper right corner (“3 hours ago”) which works just as fine, and might be even faster (right click -> copy link).